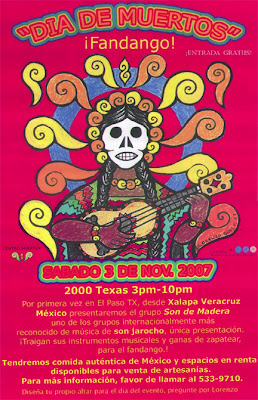 One of El Paso's best places to learn about Dia de los Muertos is at Centro Mayapan. This year's festivities will be held on Saturday, November 3 from 3 to 10PM. One of the best parts of Centro Mayapan's Dia de los Muertos event is the music. This year, the theme is based around the the musical style of son jarocho, which comes from Veracruz, Mexico. If you're not familiar with son jarocho, it is amazingly complex folk music played on instruments such as the requinto jarocho, a four-stringed guitar similar to a ukelele and the arpa (harp). Popular son jarocho songs include El Cascabel ("The Little Bell") and La Bamba. I play sones jarochos and sones huestecos (another style of Mexican folk music) on my porch whenever I'm relaxing or working outside. They are both styles that I have truly come to love. The group performing at this year's Centro Mayapan Dia de los Muertos event is Son de Madera — one of the most renowned son jarocho groups. I have two of their albums, and I can certainly say that they are one of the best groups in my collection. Centro Mayapan will also have altars, food — including many styles of molé (a blend of chocolate and chile) and champurrado (a sweet, hot beverage made from cornmeal), vendors and dancing. Centro Mayapan is located at 2000 Texas Avenue. For more information, call Lorenzo at 533-9710.